Dropbox is a free service that lets you bring all your photos, documents, and videos anywhere anywhere in the world. This means that any file you save to your Dropbox will automatically save to all your computers, portable devices and at dropbox website. Dropbox also makes it easy to share with others, whether you're a student or professional, parent or grandparent. Even if you accidentally spill a latte on your laptop, have no fear! You can relax knowing that Dropbox always has you covered, and none of your stuff will ever be lost. In addition to this dropbox synchronize all the files to online storage and you can access your files from any time and anywhere from all over the world. Initially you will receive 2GB free space but after that you can get up to 8GB of free space from dropbox by referring it to your friends. Dropbox will give you a referral link to share the dropbox with your friends and in reward your referral and you will get 250MB extra space. You can increase it to 8GB and total free space allowed from dropbox is 10GB. No worry if you need even more space. If you are a student you can get up to 16GB free space. For this you need to simply verify your email address of .edu and you will instantly receive upto 16GB free space. Dropbox has also paid storage space so if you are a business owner or you need even more space than you can get it by subscribing to a paid account and this is also really very cheap as compared to other storage services. 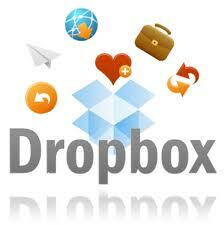 Access Files anywhere and any time from dropbox website. Dropbox saves your synchronized files to the website and you can access your files anywhere. You don't need to manually synchronize your data, dropbox automatically synchronize the files and makes all your data up to date with its highly efficient sync service. Additionally you can access your data from mobile phone devices also. Dropbox allows sharing also that means if you want to share a folder i.e your photos, documents etc to your friends than its easier to share. You just have to make a folder share folder and than send an shared folder invitation on your friends email address, after your friends approval you can share your shared folder to your friends via invitation and it will also has the synchronize facility. It is more convenient for professionals who want to share their files and make files updated to their colleagues. Dropbox also works like a system restore, it works even your system melt down. You can easily restore your dropbox data from dropbox website. It also keeps undeleted files and you can restore accidently deleted files from your dropbox website. It is very nice backup sevice.